Here's how to invest when you're heading toward the finish line. When you reach your 50s, you're coming down the home stretch toward retirement, and the stocks in your portfolio should reflect that fact. While you're not quite ready to shift to an income mind-set, your focus does need to begin a transition from growth and accumulation to capital preservation. With that in mind, here are three stocks that can still allow your portfolio to grow, while keeping your hard-earned retirement money safe. Many investors (especially older ones) are reluctant to invest in bank stocks, and after the financial crisis of the late 2000s, it's tough to blame them. 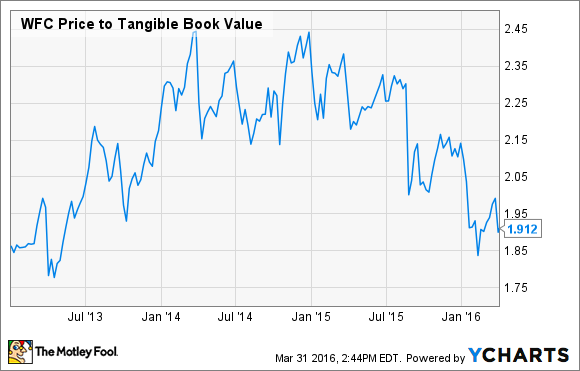 However, Wells Fargo (NYSE:WFC) isn't just another bank stock. Year after year, Wells Fargo has demonstrated that it can grow and make money while simultaneously doing a great job of managing risk. This was apparent in 2008 when the banking industry was in a panic -- Wells Fargo's superior capital position helped the bank scoop up Wachovia at a fire-sale price and expand into the largest consumer banking network in the U.S. After the crisis ended, Wells Fargo was one of the first to return its TARP money to the government. While other banks were (and still are) branching out into investment banking and "diversifying" their operations, Wells Fargo remains committed to doing what it's good at -- being a great bank for consumers and businesses. I've written before how Wells Fargo is Warren Buffett's favorite bank for these and other reasons, and it's actually Berkshire Hathaway's biggest stock holding of all. As if investors needed more of a reason to add Wells Fargo to their portfolios, the stock has felt the pressure that's been on the financial sector lately and trades at its lowest valuation in years. One highly underrated way to get income and growth is with real estate -- specifically with real estate investment trusts (REITs). High-quality REITs such as National Retail Properties (NYSE:NNN) can deliver decades of strong performance, without too much downside risk. National Retail Properties, as the name implies, invests in retail properties. Specifically, the company mainly holds freestanding single-tenant properties, all of which have triple-net, or "net" leases -- hence the company's stock symbol. Under a net lease, tenants are responsible for variable expenses such as property taxes, building insurance, and maintenance. And, these tend to be long-term leases (15-20 years) with annual rent increases built in. This results in a steadily growing, predictable stream of income, as well as a high 99.1% occupancy rate. In fact, National Retail Properties has raised its dividend for 26 consecutive years. Additionally, since REITs are required to pay out most of their income to shareholders, you get a relatively high 3.8% yield. Over the long term, the property appreciation and the dividend can combine to produce some pretty outstanding returns. In fact, the company has averaged a 14.8% total return over the past 25 years, which means that someone who invested $10,000 in National Retail Properties 25 years ago and reinvested their dividends would have seen their investment grow to more than $315,000. I'm in my 30s, and most of my friends around my age won't touch a stock such as Procter & Gamble (NYSE:PG). The most common answer they give me when I ask why? "It's boring." Boring stocks have actually been a theme for this article, if you haven't noticed yet. After all, what businesses can be more boring than savings & loan banking and commercial real estate? However, the stocks mentioned here are exactly the kinds of stocks people should own – simply put, they make money year after year. In Procter & Gamble's case, its main competitive advantage is its portfolio of brand names, more than 20 of which generate $1 billion in annual revenue. In fact, I'd be willing to bet that the vast majority of people reading this have a few P&G products in their home. Just to name a few, if you have Bounty paper towels, Crest toothpaste, Downy fabric softener, Gillette shaving products, Pampers diapers, or Tide laundry detergent, you're a Procter & Gamble customer. This valuable brand portfolio gives the company significant pricing power over rivals (this is why you'll pay more for Downy fabric softener than a generic product). As a result of its brand portfolio and excellent management, Procter & Gamble has been able to steadily grow its profits, which it has passed along to investors. In fact, the stock pays a healthy 3.2% dividend, and has increased its payout for a remarkable 59 consecutive years. The bottom line is that just because you're no longer chasing "it" stocks in your 50s doesn't mean you have to sacrifice growth. 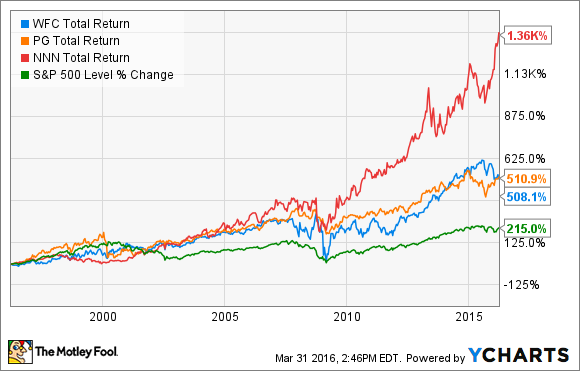 Just look at how these three performed over the past 20 years compared to the S&P. These are three of my favorite stocks for 50-somethings, but that doesn't mean younger or older investors shouldn't own them. In fact, the principles discussed here -- such as consistent outperformance, annual dividend growth, and conservative balance sheets -- can have incredible wealth-building power over time, and therefore can be applied to your portfolio, even if your 50s are decades away.